The Valencia High School Concert Band was selected to perform at the legendary Carnegie Hall in New York City on Sunday, March 17. 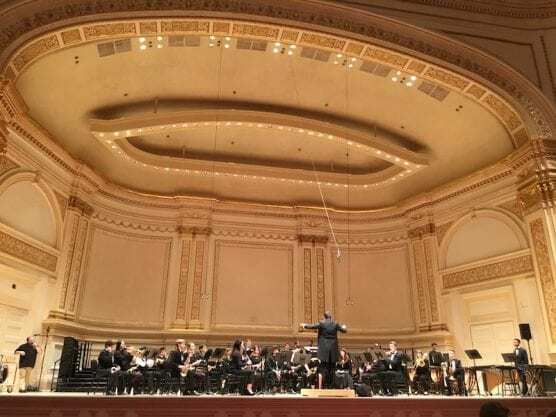 The Concert Band participated in the Choirs of America’s Harmonic Convergence Concert at Carnegie Hall. Carnegie Hall, which has set the international standard for musical excellence, is considered one of the most prestigious concert halls in the world. On a Hymnsong of Phillip Bliss by David Holsinger. Students were excited to grace the stages of Carnegie Hall. After rehearsal, 9th grade flautist, Ellie Lyznick exclaimed, “We just warmed up on the stage and it was amazing!! !” After intense rehearsals and performing earlier in the week in the St. Patrick’s Day Parade, the students still had some time to experience New York City aka the Big Apple— seeing a Broadway play, taking a cruise around the Statue of Liberty, and walking the streets of Time Square. It’s the first time in New York City for some of them. An upcoming exciting event for the Valencia High Marching Band & Color Guard is the WGASC competition (Winter Guard Association of Southern California) which will be hosted by Valencia High on Saturday, March 23, 2019. The event begins at 10:00am with awards taking place at 3:30pm. There will be lively performances, food and beverages. All ticket proceeds go towards sustaining the music and color guard program. Visit: http://www.prideofthevikings.com/fundraising/. The Pride of the Vikings Marching Band and Color Guard is from Santa Clarita, California. The program is known for their success in marching, concert, and jazz band. The Marching Band recently won their sixth consecutive medal out of all division 3A bands in Southern California. The programs have toured Disneyland, Las Vegas, Disney World, San Francisco, and Hawaii. (VHSBFB) is the booster organization supporting the Valencia High School band and color guard programs. VHSBFB is registered as a 501(c)3 non-profit corporation in the state of California. All photos courtesy of Terry Collier.